The 2018 Market Animal Sale Participation program begins August 1, 2018 and ends July 31, 2019. First year exhibitors must acquire a minimum of 6 points to be eligible to sell an animal in the 2019 Market Animal Sale. All other youth exhibitors must acquire a minimum of 7 points to be eligible to sell an animal in the 2019 Market Animal Sale. Each person is responsible for keeping track of his/her eligible activities for the year. The booklet must be completed and turned it or postmarked by August 1, 2019 to be considered for Market Animal Sale eligibility and other awards and/or prizes. Why do we offer the sale? 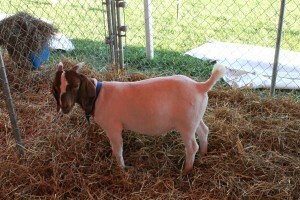 To provide junior livestock producers a market for projects graded and sold at the Manitowoc County Fair. To provide an incentive and encouragement to livestock projects and appropriate record keeping. To recognize members who do quality work in selecting, feeding, and showing their projects. To teach a greater understanding of meat animal evaluation at the packing plant level. What will be offered at the sale? Hogs: Weight over 230 pounds. Any hog greater than 290 pounds will be eligible for sale however exhibitor will only be paid up to 290 pounds. Lambs: Weight over 115 pounds. Anyone interested in supporting youth. Anyone who enjoys and appreciates a supply of quality meat. Anyone who would gain beneficial advertising value. Potential bidders register at the sale ring, but there is no obligation to buy. Animal weights will be stated and bidding will be based on price per pound. All accounts are to be settled with the clerk immediately after the sale. The buyer will assume ownership of the animal immediately after the account is settled. Entries open to all 4-H, FFA members, or any other youth organizations in Manitowoc County. We are a group of volunteers voted onto this board for 3 year terms by the exhibitors and their families at the annual meeting. Your suggestions and questions are welcome to any one of us. Our purpose is to make the Manitowoc County Market Animal Sale the best quality sale for our buyers to support, as well as striving to educate the youth exhibitors all about animal care and responsibility throughout the year. We currently meet the second Sunday of each month at MCOC at 6:30 PM, but that is subject to change at the board’s discretion throughout the year.